We've had a very difficult and sad day on the farm. For the first time we lost a kid to illness. 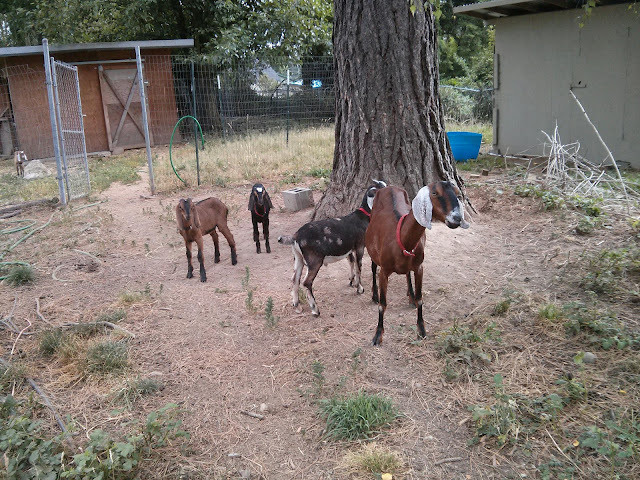 One week ago three of the six kids, one from Rosemary named Alpha and two from Chestnut named Mocha and Americano, developed some severe diarrhea. The sort of thing we have seen before when a goat eats a little of a bad thing or too much of a good thing which imbalances their digestive system. We did what we could at the acute phase then waited it out overnight. They were much better the next day and more improved the following day. They were even nursing from the moms again. 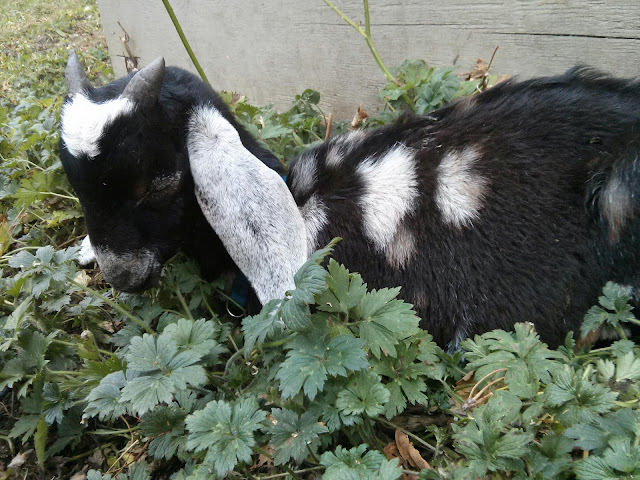 Then yesterday Tim noticed (remembering in hindsight) that the moms had more milk than usual. Some variation is normal and it wasn't enough at the time to trigger any special warnings. This morning when I peeked my head out there to give them vegetable scraps I could tell something was wrong. The two older ones were sluggish and the youngest didn't even stand up to come over. Alpha was dehydrated and surprisingly skinny. If you think you can handle animals on an average day don't forget to take into consideration the very sick days. Water, bottle feeding, and warm mash for three hours was too little too late. As I carried him out of sight of the herd with my .22 ready he breathed his last in my arms. I was even too late to pull the trigger. 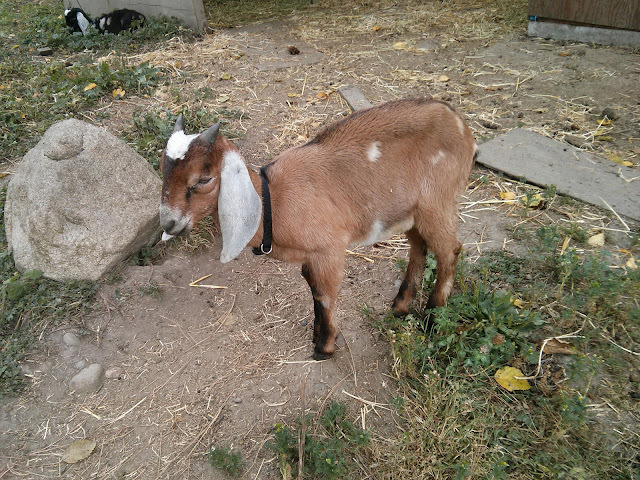 This is not the first time I've dealt with goat illnesses but the first where I missed the signs and intervened too late. Mocha and Americano are looking the same or slightly better than this morning after a dose of probiotics, three bottle feedings of milk, offerings of fresh alfalfa, water, and baking soda. I am hopeful about them. Thanks to a co-worker needing to trade shifts I got tomorrow off and instead work on Saturday; a huge blessing since time flew by and I didn't think to call my boss to request tomorrow off until after hours. I'll definitely update you on the status of the kids tomorrow. Pic #1: the healthy kids. Very difficult to get a picture of since they're constantly moving and coming up to me. #3: Americano resting after his second forced bottle feeding session.